Note: Class sizes are very small with maximum of 5 students. If you sign up for a class and you find out that you can not attend, please call us as soon as possible to cancel so that someone else can take that class. With the Beginner Copper Foil Class, after you paid to hold your spot, there are no refunds unless you call to cancel at least 1 week prior to the start of the class. Class Dates and Time:March 2, 2019 9-10:30 am and the first Saturday of each month. This is class is a 1½ hour introduction to cutting glass. You will learn how to use the tools of the trade to cut straight lines, inside curves, and outside curve as well as complex shapes. Maximum of 5 per class so, you will need to preregister by either calling (512) 869-6630 or visiting our shop. While all tools are provided, if you have tools, you are encouraged to bring your own tools so that you can practice with the tools you will be using at home. (You will receive a 10% discount on all cutting tools purchased on the day of the workshop). You need to be able to attend all 4 classes in order. You must also do a pre-class prior to the first class at a time of your choice during open store hours. Please call to reserve your spot as soon as possible since there is a maximum of 5 students. You must pay at the time you do your pre-class. There are no refunds if not cancelled at least 1 week prior the the date of the first class. 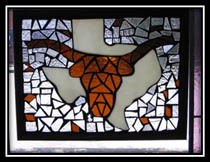 Cost: $75 includes pre-class (pick pattern and glass) and four 3 hour classes. Supplies and tools are additional cost but you will be given a 10% discount on all supplies and tools purchased for and during your classes. Tool rental is available for $45 of which $30 is credited toward the purchase of tools during the class. 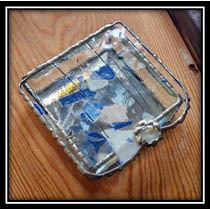 $45 includes instruction for this 3 hour class, 4 1.5 X 4 bevels, mirror bottom, brass tube hinges. This class is for people who are not happy with their soldering while doing Copper foil projects. 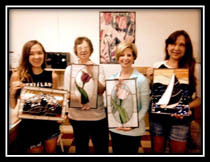 You will need to bring a small panel, suncatcher, or 8 1″ strips of glass (six of which will be 6″ long and two will be “6.5” long) which will need to be foiled prior to class. You will also need to bring soldering iron and 60/40 solder. You will learn to create a good bead as well as neat solder joints. If there is time, we will do some decorative soldering. This class is for people who would like to dress up their boxes, ornaments, or panels with some fancy soldering. You will need to bring 8 1″ strips of glass (six of which will be 6″ long and two will be “6.5” long) which will need to be foiled prior to class. You will also need to bring soldering iron and 60/40 solder. Previous experience with soldering is required. Next class will be in early 2019. Call with your interest. There are 3 classes and you need to be able to attend all 3 classes. There are 2 weeks between classes so that you can complete your “homework”. $60 includes 9 hours of instruction. Class 1 design for leaded glass, how to draw out your “cartoon” for a leaded glass panel. Homework is to complete cutting out all of your glass for a maximum 2 ft2 panel. Class 2 Bring all your glass cut and learn to cut lead and build your panel. Homework is to complete the building of your panel. Cost: $45 includes everything including tools. 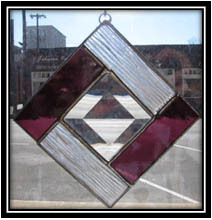 You need no experience and will make and take home a copper foiled suncatcher with central bevel. 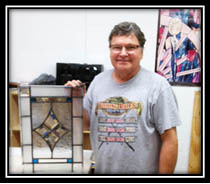 This is something you can do with your friends or family (anyone over 16 years of age since we will be working with solder and lead) or to see what is involved in creating stained glass. Maximum of 5 per class so, you will need to preregister by either calling (512) 869-6630 or visiting our shop. Usually have this class in early spring in time for your new garden. Call with your interest. 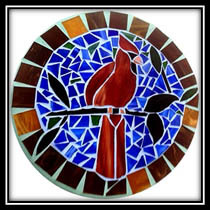 $55 includes scrap glass, 12×12 square or round stepping stone, adhesives and grout for this 3 hour class. Patterns available or you can design your on. The main subject of the stepping stone for example the one on this page is the cardinal on the branch, needs to be cut and brought into the class. $45 includes wooden cross/picture frame or mirror, colored mastic, glass. Cost: $40 includes all 12 triangles/foiled and instruction. You can add a crystal for the center for $5. If you need tools, soldering iron, and solder $50. Need to bring soldering iron, solder. Class date and time: to be announced. Please call if interested. You will need to bring your glass cutting tools, soldering iron and solder. Rental tools and supplies such as Solder provided for $10 additional. 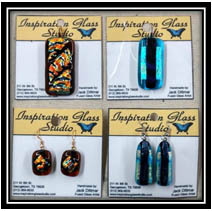 Glass Class Descriptions– We do still provide kiln time $15 for first fuse and $10 for second + shelf paper or other supplies. That includes use of the entire 16″ kiln space. if interested, please call for us to set up a time. It’s easy and fun to do. In the class you’ll make 2 Pendants and a set of Earrings. You’ll choose the Shape, Color, and Style and then assemble. We’ll fuse your jewelry, install the bails, and install French hoops or posts on your earrings for your wearing pleasure. We’ll provide all supplies needed to complete your Jewelry; you just bring your own tools. Tools can be rented for just $5. Cost for this workshop is $45. You will need to preregister by either calling (512) 869-6630 or visiting our shop. For this exciting Glass Workshop. We’ll be using a new glass technique called “On-Edge Glass”. 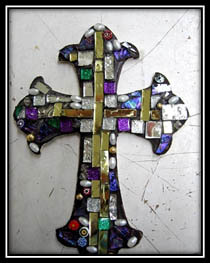 You’ll create a beautiful 8″x6″ Cross. 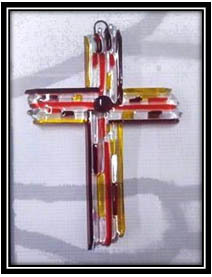 You’ll choose your accent colors from a wide variety of transparent Sys96 glass and will use a Clear Icicle SP100SF96 for the main body of the cross.. We’ll provide all necessary fusing supplies (cost: $20.00). You’ll need to bring your glass tools. Tools to bring: glass cutter, runners, breakers, mosaic cutter, push pins, at least (1) six inch Morton layout and Elmer’s School Gel Glue. The costs for this workshop are $30 and Supply Fee ($20). Tools are available for $5. You will need to preregister by either calling (512) 869-6630 or visiting our shop. Enjoy learning the basics of creating a Beautiful Glass Pocket Vase. We’ll provide all the glass, frit, stringers and noodles, glue, fusing paint, fibre paper, fusing paper, and kiln boards to prepare your project piece. 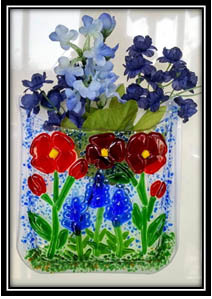 After you create your Pocket Vase, We’ll fuse your project to be ready for pick up in a few days. Cost: $45 You will need to preregister by either calling (512) 869-6630 or visiting our shop. We will provide everything you’ll need to create your very own Beautiful and Elegant Coral Bowl. No Fusing or Glass Cutting experience is necessary. We will have a wide variety of transparent glass colors available for your use. After you create your bowl we will fuse and drape the bowls for you. You must call us at (512) 869-6630 or visit our shop to schedule and reserve your spot in a class. Cost for class: $35 per person, you can create an additional bowl for just $15. Come join us for a Unique Glass Project. We call it “Glass on Glass Mosaic”. 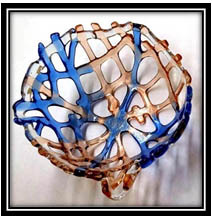 We’ll be creating a “Tree of Life” on an 8” Round Sys96 Clear Icicle Glass. 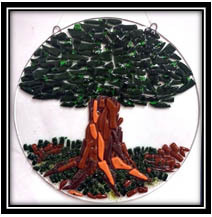 We’ll provide all necessary glass supplies and a pattern to complete your very own Unique and Beautiful Tree of Life. You will need to bring all of your glass tools and some Elmer’s School Gel Glue. Cost for this workshop is $50 plus $15 for supplies. Tools can be rented for $5. You will need to preregister by either calling (512) 869-6630 or visiting our shop.